US Vice-President Mike Pence has called criticism of his wife’s decision to resume teaching at an anti-LGBT school “deeply offensive”. In an interview with a Catholic TV network, Mr Pence said it amounted to an “attack” on religious education. The school that Mrs Pence chose bars staff from engaging in or condoning “homosexual or lesbian sexual activity” and “transgender identity”. She previously taught art there for 12 years while Mr Pence was in Congress. Many US social conservatives cite their religious beliefs to justify opposition to gay marriage. 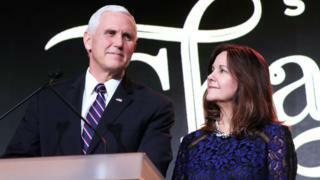 Mr Pence, a Christian evangelical, told Eternal Word Television Network on Thursday: “My wife and I have been in the public eye for quite a while. We’re used to the criticism. 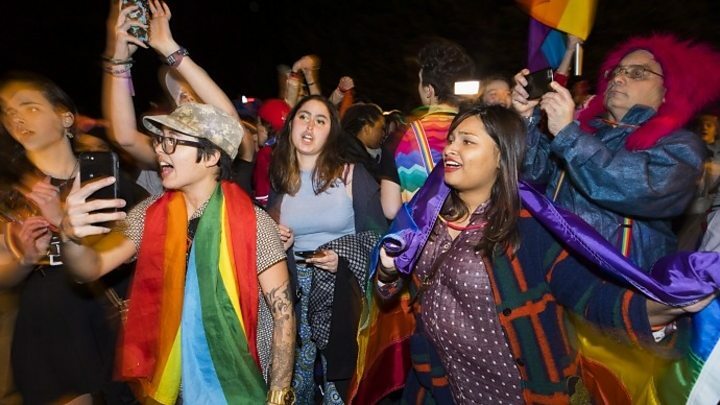 According to a teaching application for the Immanuel Christian School – the private school in Springfield, Virginia, that Mrs Pence chose – employees are required to sign a pledge opposing LGBT lifestyles. “I understand that the term ‘marriage’ has only one meaning; the uniting of one man and one woman,” teachers are required to affirm. In an agreement with parents on their website, the school says they can “refuse admission” or “discontinue enrolment” of a pupil if “the atmosphere or conduct within a particular home, the activities of a parent or guardian, or the activities of the student are counter to, or are in opposition to, the biblical lifestyle the school teaches”. Mr Pence told the TV network on Thursday that there is “a rich tradition in America of Christian education, and frankly, religious education broadly defined”. Before becoming vice-president, Mr Pence expressed support for the controversial practice of gay conversion therapy. As governor of Indiana he signed a bill that critics said amounted to state-sponsored discrimination of LGBT people. But supporters of the legislation said it simply upheld religious beliefs. Mr Pence became the first vice-president to speak at the openly anti-LGBT Family Research Council’s annual conference in 2018.